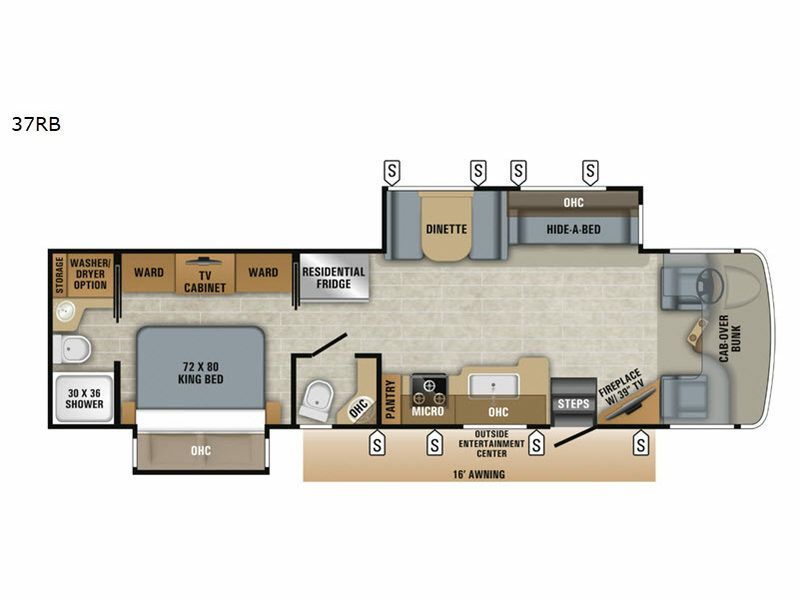 Your family of seven will enjoy camping trip after camping trip with this double-slide Seneca Class C diesel motorhome. Sleeping accommodations can be found all throughout the interior with a king-size bed in the private master suite, a bunk over the cab, and a dinette and hide-a-bed in the living area. 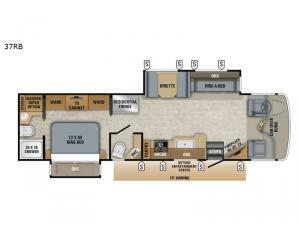 Because this unit has both a full and half bathroom, the rear master suite is made ultra luxurious with its own full bathroom, king bed slide, and 32" LED HDTV. The cab area is just as indulgent as the rest of the coach with its privacy curtain, infotainment dash radio with GPS and CD/DVD player, and ultra leather seating. With a Jayco Seneca motorhome, you will not only enjoy each vacation destination, but you will also enjoy the ride getting there because each Seneca includes enough luxury for the long haul with features like the JRide Premium which is a driving system with a powerful blend of precise handling and renowned stability that all rests upon the Freightliner S2RV chassis and Cummins ISB 6.7L, 360 HP diesel engine. The high-gloss, fiberglass exterior with its deluxe full-body paint and diamond shield are what first attract you to this sleek RV, and the touchpad locking system with keyless entry makes it easy to access the interior whenever you need. You may find yourself spending all of your free time outdoors because of the exterior entertainment center that comes with an AM/FM/CD/DVD player and a 39" LED TV that will allow you to watch a movie in the cool night air underneath the stars, and the outdoor shower will come in handy when you need to rinse off any dirt that you don't want to bring inside.